One of my biggest flaws is overthinking. Yes, I am a worrier. I over analyze a situation, and one negative idea splits into 2 and then those split,and before I know it I am having a panic attack. The key is to be aware of your habits. When I notice myself starting to dissect a situation, I try to imagine seeing a pure white light. I literally, induce a brain freeze. I wipe out all thoughts, and change mental subjects. When you over think a situation, it will usually handicap you from being able to do anything. Fear sets in, and starts to limit all your possibilities. “Preparing” for a situation, and over thinking are two different things and it is important not to mix the two. Preparing, means you are taking action whereas over thinking is just over analyzing the “what ifs”. Take a chance, and don’t over think it. 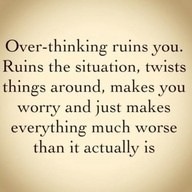 I manage at the same time to overthink stuff, and suppress it. So I go all “OMG OMG OMG OMG, this is going to happen, and then this, and then this….” and then it’s too much and puff! It all disappear and I decide to go out for a bike ride instead of acting… which is good for some things out of our control, but not for others that could actually be prevented!